HD output : It is CMOS 1200TVL security camera that use in HD mainboard. It is very stable and good day night vision. It is suitable for all the common analog security system. High quality housing : This camera is high quality plastic housing that can be installed outdoor and indoor. It is IP66 waterproof. IR Leds : 48 Leds supply enough back-up light to make the night vision clear. (Color in day time,black & white in night time)and 6mm lens built in. INNER IR CUT : IR CUT is the important parts to change day night vision automatically. Inner IR CUT can ensure change day night vision smoothly. Warranty :We supply 1 year warranty in parts and customer support. If there is any quality problem in this camera, we can supply parts to replace, and give customer support in anytime.If you still can not sure the how to connect this camera,please just please send the message to us. Thank you ! 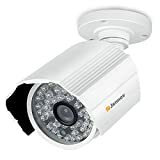 With robust weatherproof and resist metal casing, this indoor/outdoor camera is ideal for your surveillance applications and it works well in the areas such as rain, dust, or wet environment. This infrared color camera works on day and night and it will do automatically switch to black and white picture at night. It provides you with the clear high resolution image. Equipped with 48 infra-red LEDs, this camera will make any objects visible up to 45FT. The camera easily connects to your TV, VCR or security monitor for the protection of your home, office or other valuables. Inner Ir cut can change day night vision smoothly. The most important is it is easy to install.